It must be the only volcano named after a British ambassador to Spain. Mount St Helens was also known as the Mount Fuji of America: a perfect cone standing above the country side. 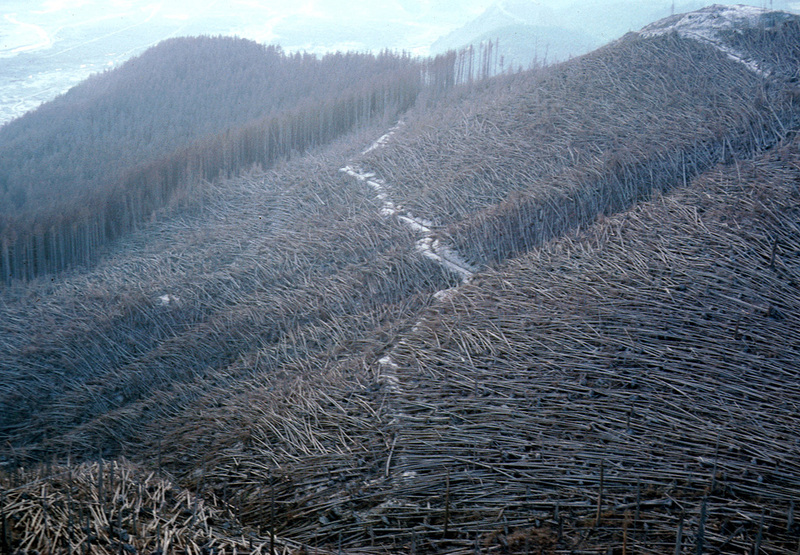 The 1980 eruption destroyed much and had a significant human cost. It also damaged the mountain badly: the perfect cone gone, and replaced by a diminished, broken, lopsided structure. Photogenicity lost. The eruption of Mount St Helens was the best predicted of the 20th century. It was no Pinatubo, which had stayed below the radar until a few months before the eruption: this one had been predicted as long as five years before the event. A publication by Dwight Crandell et al. in 1975 stated that Mount St. Helens was the one volcano in the United States most likely to reawaken: an eruption is likely within the next hundred years, possibly before the end of this century; It .. would affect a broad area beyond the volcano. In a follow-up publication, they predicted the damage such an eruption could do. It was an accurate forecast. There are a number of major volcanoes in the US Cascades region; the domes clearly stand out above the rest. The region has been fairly quiet since the time of Lewis and Clarke. But that is deceptive. Just like the last major earthquake here happened just before our records begin, so also its volcanoes. The wake-up call was LOUD, and it was destructive. The main event started with an earthquake, on March 20, 1980. This seems not uncommon in major eruptions: an earthquake gets things going. It happened in Krakatoa, three years before the eruption, and in Vesuvius, 17 years before. In St Helens activity ramped up rather more quickly than that. Five days after the first earthquake the mountain first erupted with a (minor) summit explosion. For a month and a half, the summit explosions were phreatic with ash and steam but no magma. A bulge began to grow on the north side, where the surface was moving outward at a staggering speed of 1.5 meter per day; the summit behind it began to sink. On May 18, 1980, the northern flank could no longer contain the pressure. The final collapse was triggered by another earthquake but would have happened without it as well. The M5 earthquake hit a bit after 8 am on this Sunday in May. Within seconds the north side of the mountain, weakened by the bulging, cracked into several blocks and began to slide down, first into the crater but seconds later also down the outer slope. The rock slide reached speeds well over 100 miles per hour. The devastating avalanche picked up water from Spirit Lake on the way which provided further lubrication. The avalanche deposited a volume of 2.5 km3, covering 60 km2. The Trout river channeled much of the flow and was hit with 50-m deep deposits. The removal of the side of the mountain opened the way for the main explosion, both through the reduced pressure and because one of the cracks split open the magma chamber which had caused the bulging. This brought up the first magma of the eruption. The blast came up through what was the central crater, but was funneled northward, following the avalanche. Moving at speeds up to 900 km/h, the blast overtook the avalanche, and mowed down the forest like blades of grass. Nearby, nothing was left standing. Further away, trees in the shelter of hills survived. Even further away, trees still stood but all the green was burned off by the heat of the blast wave. The total affected area covered 600 km2. 33 seconds after the beginning. Two blocks have slid down, exposing the magma of the cryptodome. The explosion at the crater has just begun. Source: click on figure. Although the eruption would continue with further explosions for some 9 hours, the main event was now over, barely 30 seconds since the earthquake that triggered it. The after effects took longer. The avalanche ran for over 10 minutes. The blast wave was faster, taking only a few minutes before weakening to a survivable level. The mushroom cloud was still rising, reaching almost 20 km in 10 minutes. Winds moved it to the east, and ash began to fall, thickly up to 300 km away in some places, thinly much more distant, with the furthest fall close to Santa Fe in New Mexico. The ash amounted to 0.2 km3 DRE. The gaseous, frothy magma coming out of the crater caused a number of pumice-loaded pyroclastic flows throughout the day, but these stayed close to the crater. Steam explosion caused by the heat of these flows continued for weeks, and one even happened a year later. The pyroclastics melted snow and ice on the mountain, and lahars or mudflows began to flow, on all sides of the mountain. These were damaging, amongst others because of the sediment they dumped in various rivers and reservoirs. Even shipping in the Colombia river was badly affected. The mudflows reached 20 meters in depth along the Trout river. Mudflows can be life threatening and, as people often live near water and rivers, can affect large number of people. Luckily, St Helens erupted into a sparsely populated area. The sound of the explosion was heard near and far – but not in the middle. 300 km away, the boom broke windows. The sound was heard as far as Canada. But people nearby (where perhaps they shouldn’t have been) heard nothing. One reported comment from a person near (or in) the exclusion zone: Something didn’t feel right, though I couldn’t quite put my finger on what it was. Then it dawned on me. It was absolutely quiet. There was no twittering of birds or scurrying of chipmunks or other soft sounds that are usually in the background. I heard Pam gasp, then cry out, ‘My God, the mountain has blown!’ The mountain had exploded close to them and they heard nothing! This zone of silence is not unusual. Krakatoa was also deafening nearby, but not further away, although it was heard again thousands of kilometers away (reported even from the Caribbean, on the opposite side of the Earth). Thinking about it, lighting nearby is deafening but distant lightning is seen but not heard. How is this possible? Sound waves do not quite travel on straight lines in the atmosphere. The reason is that the sound speed changes with temperature: sounds travels slower when it is colder. Higher up in the atmosphere, it is colder and sound slows slows. Imagine a sound wave which travels from the top of Mount St Helens to the ground. The wave travels faster at ground level than higher up. This make the wave bend upward. It reaches the ground further than you would expect from a straight line of sight. There is a distance beyond which the sound no longer reaches the ground, but bends away up in the atmosphere. How far this is depends on how high above the ground the explosion happened. (If there is an inversion layer in the atmosphere, sound waves can get trapped underneath and travel long distances on the ground.) Next time you fly in a hot air balloon, try to distinguish which sounds you can hear: it depends on the temperature gradient in the air. So some distance from St Helens, the sound wave bend away from the ground. Further away, the explosion could no longer be heard – at least on the ground. But why did the booms reach the ground again much further away? This is because there is a second inversion layer in the atmosphere, at the top of the stratosphere. Here the temperatures increase rapidly with height. When the sound wave reaches here, 25 km up, it now bends the other way, sharply downward – effectively, it reflects off this layer. Now traveling down again, the sound, rather weaker and without the high frequencies, can reach the ground again – 200 km from the source. Intermittent explosive activity at St Helens continued for several years, from the summer of 1980 to 1986. At the same time, dome building started inside the excavated crater. By 1986, the new dome had reached 400 meter above the crater floor. This is less impressive than it sounds: the dome lacked volume. At this rate, it would take 200 year to rebuild St Helens. The speed of rebuilding also raises questions on how old the mountain really was. What is the history of St Helens? The early dome building was aided by magma from the 1980 eruption, now gas-less and squeezed out in effusive eruptions. As this magma source was depleted, by 1986 activity declined and apart from some explosive eruptions in late 1990 and early 1991, the mountain became largely silent. Activity resumed in 2004, with dome building and minor eruptions continuing for four years. This activity was different: the magma had solidified underground and was pushed up in solid form as ‘Spines’ and smooth ‘whalebacks’, eventually reaching 400 meter high. It pushed out 95 million cubic meter, doubling the volume of the new dome, but the overall rate of dome building had actually declined. Now it would take 400 year to rebuild the mountain. There were two explosions, in 2005, but otherwise this episode was effusive only. From early 2008, silence reigned and nothing much happened. Between March and May 2016, earthquake swarms indicated a slip on a small fault and these may indicate a bit of magma is on the move again. Earthquake activity has since reduced to background levels. However, it is likely that dome building will continue in the next years to decades, through minor eruptions. Indians on the Cowlitz River watching an eruption of Mount St. Helens, as painted by Canadian artist Paul Kane following a visit to the volcano in 1847 (Photograph courtesy of the Royal Ontario Museum). Prehistory ended late in the Americas. Written records go back only a brief time. Still, they give a picture of a frequently erupting volcano. There was a major explosive eruption around 1800. Eruptions were frequent but small between 1831 and 1857. The painting depicts one of these eruptions, notably off-centre. In 1857, the final eruption of this sequence formed a dome on the northern flank, later called Goats Rock lava dome. Between 1857 and 1980 St Helens was quiet. This time span exceeds a living memory, and the population had largely forgotten St Helens was an active volcano. The 1980 flank bulge occurred in the location of the Goats Rock, following the old but forgotten weakness. Eruptions relive their past. Older eruptions are known from their deposits, and especially the mudflows can be dated through their organic content. These records are good for large eruptions such as 1980. but will have missed many small eruptions (such as the activity since 1980). The records show many eruptive layers. The oldest ones date from about 40,000 yr ago. 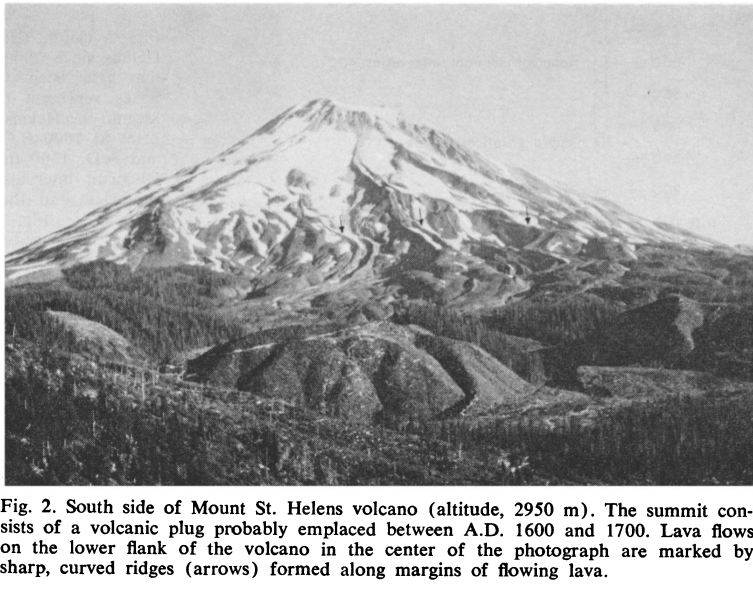 This means St Helens is actually a very young volcano: other Cascades volcanoes are much older. Activity was not excessive, with perhaps even a 10,000 yr period of nothing. Over the past 4,000 yr, eruptions have been frequent. A number of (pre)-historical eruptions have caused mudflows reaching tens of kilometer, pyroclastics, and deposits reaching neighbouring states. There have been quite a few eruptions larger than that of 1980, most recently in 1480. Century-long periods of dormancy, such as prior to 1980, appear to be the norm for St Helens. Between 1400 and 1800, there were several eruptive periods separated by hundred-year periods of nothingness. There were longer dormancies from 400-1300, 800BC-400BC, 1600BC-1200BC. The 4000-year record of frequent eruptions and brief dormancy periods was the reason Crandell in 1975 stated that an eruption was likely soon. With so many eruptions, why was the mountain so symmetric and photogenic? The dome was destroyed multiple times over the past 4000 year, and probably earlier as well: there is evidence for blocks similar to those in the 1980 flank collapse in the old deposits. The steep sides indicate a tendency for explosive eruptions: the combination of collapse and explosion would have been as devastating in the past as it was in 1980. In fact, the beautiful dome before 1980 was a recent formation. The oldest summit rocks were less than 1000 year old, and most of the dome probably formed between 1600 and 1700. The eruption of 1480-1482 may have destroyed the previous dome. But there is every reason to believe that previous domes would have looked similar to the one we lost in 1980. Here is a volcano that keeps rebuilding itself, in a volcanic minecraft. By 2400, it should look as good as new again. The smoothness of the dome in fact was because of this very youth. Erosion hadn’t had time to act its ravages. As in humanity, volcanic beauty is transitory: try to hold on and find it is slowly lost, but give it up and re-invent yourself can make it last. Volcanic beauty comes from the inside. Where does the magma come from? The main source is the subduction of the Juan de Fuca plate. The heat, together with the water, creates melt and the melt percolates upward. It collects in magma chambers: each of the Cascade volcanoes is supposed to have such a magma chamber underneath. Recent studies indicate this picture is too simple. 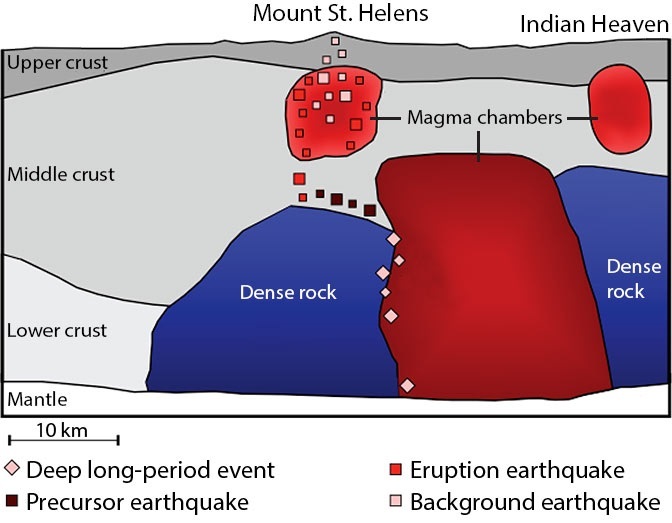 Extensive seismic mapping found the expected magma chamber underneath St Helens, 2-10 km deep, but a much larger, deeper chamber is offset and seems to feed both St Helens and the Indian Heaven volcanic field. The 1980 eruption was preceded by a chain of earthquakes on a line linking the deep magma chamber to St Helens; it seems an injection from the deep into the shallow chamber eventually caused the eruption. 4000 years ago, St Helens changed mode from infrequent to frequent eruptions. What happened? Perhaps the connection between the two magma chambers opened up. It turned St Helens into one of the most dangerous volcanoes in the US. Since this time, the Indian Heaven volcanic field has not erupted, although that is in itself not conclusive as apart from activity about 6000BC it has not been very active. Maybe one day the magma will redirect itself and this field will become the next Cascade volcanoes, leaving St Helens to magma-starve. Let’s come back to the link between earthquakes and volcanic eruptions. The destabilizing effect of a good shake can trigger an eruption that was imminent anyway. The shaking and shifting of the load above changes the pressure, and eruptions are very sensitive to pressure. Darwin writes about how the major Concepcion earthquake which he experiened (M8+) triggered eruptions in four distant Chilean volcanoes in the days after. Earthquakes within the volcanic system open up underground pathways for the magma. They can themselves be caused by increased pressure from the magma, as in the numerous quakes that opened the Holuhraun dike system. This may also be what happened in the Vesuvius quake of 5 Feb 62 AD, which started the sequence leading up to the eruption of 79, although we don’t know that for certain. In subduction zones, the region of the severe earthquakes is offset from that of the volcanic activity, but there can be many fault lines closer to the volcano. That is the case in St Helens where there are regular tectonic earthquakes from local faults. Lacking those, volcanoes have to generate their own earthquakes and they often do. The Cascadia region is subject to major earthquakes, in fact scary ones. The last one hit on Jan 26, 1700. Prior to that, big shakes are dated around 900 (that one is not well dated and may have been later), 700, 300, 500 BC, 900 BC, etc. Looking at the timeline for St Helens eruptions, these quakes tend to fall in, or coincide with the onset of, a period of dormancy. For instance, the 1700 quake was at the start of a 100 year sleep; no doubt the explosive awakening 100 year later, in 1800, was caused by the kiss of a prince (think before you kiss!). The evidence is far from conclusive, but a working hypothesis could be that the major Cascadia earthquakes suppress activity at St Helens – at least for a while. The message from St Helens is that historical activity matters. A frequently erupting volcano is likely to erupt again. The 100-yr dormancy periods are right in the ‘awkward’ range: long enough to outlast living memory, and short enough that the chance of an eruption is rather high. From one side, the number of casualties was not high. From the other side, perhaps it should have been zero. This was not an unexpected eruption, warnings were given five years before and the mountain announced its intentions two months in advance. That is a discussion that can rumble on for a long time. The next large eruption in Cascadia probably won’t be from St Helens. Which ever it is, the challenge will be to provide warning with enough certainty to get people to move, and enough lead time to let them get out. But not so much they will try to go back. Good luck. A thorough, and a thoroughly fascinating article. Thanks Albert! Mt St. Helen’s was one of the volcanoes that awakened my interest in them. I followed the events of that eruption with fascination. and was an Engineer with Union Pacific working the Davenport,Wa. yard during the May 18th eruption..
Sure it does… inside the combustion chamber of a turbojet. Careful. To kill an jet engine you need two things. Deprive it of oxygen/airflow or cut the fuel supply. Check the facts. Ash melting and sticking to fan blades does not stop the engine. It stalls, glass melt on fanblades cools down (because it continues spinning) but you can restart after gliding out of the plume. Ash from Eyjafjallajökull did not stall a single engine. Incorrect (Faulty) regulation did stop the flights. I did check the facts. That’s why I edited out the original text since I didn’t want to get into the details. As for it melting, thats about the only place outside the volcano where it can melt. Not piled off to the side of an airport like it was snow. I guess it could have been possible to mix it with a binding agent like cement to stabilize it when it gets damp, but that would leave you with piles of set concrete instead. Extremely though concrete according to tests. Ash does not melt like snow, therefore removal can become a problem. Bard’s got a 3, but don’t see a star on map yet. 3.0 doesn’t get a star in the IMO system. Is Mt. Saint Helens capable of producing a caldera forming VEI 7 eruption, just like what Mt.Mazama did in the past? Currently or in the near geological future? No. Not enough pressure in the magma chamber, and the system is likely too open for a caldera eruption to occur during our lifetimes. But sometime down the line (within the next 10,000 years), this is certainly a possibility. One of the critical questions for something like this is how large the magma chamber is, and how much it gets depleted or damaged during the seemingly frequent destruction of the actual edifice. Given the high level of activity, we can see that there has been a high influx of magma into the system over the last 10,000 years or so, so this would likely contribute to expanding the magma chamber gradually over that time. The explosive nature of the magma composition in St. Helens also likely does not help. Right now, I think the system is too open (as seen by the non-explosive dome building over the last 20 years), and I’m not sure the primary chamber is large enough to do something like this. One thing worth noting is that Mazama / Crater Lake had a VEI-6 eruption only 200 or so years before its VEI-7 caldera formation, so even with the somewhat frequent large eruptions, we can’t assume that the system is entirely depleted or incapable of going larger. Also worth noting – for many stratovolcanoes, the size of the overlying edifice also plays a role in caldera formation. Large edifices are good at bottling up pressure, allowing it to build in the below chamber. 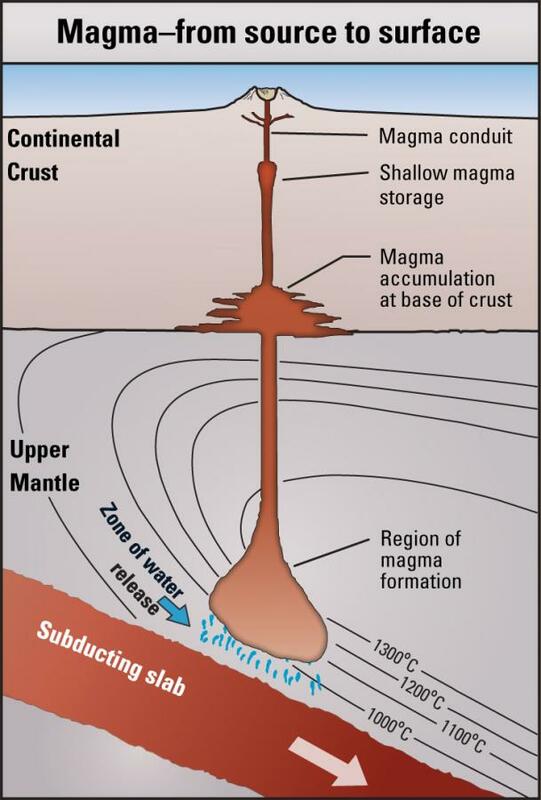 They also put significant downward pressure on the magma chamber, which will become weakened if a large volume of magma were to escape during an explosive eruption. For St. Helens and many similar volcanoes that seem to undergo regular collapse events, I tend to believe this plays a role in alleviating a lot of the pressure, henceforth preventing what would have otherwise lead into an eventual caldera eruption event. Crater Lake is the only VEI7 eruption in the Cascades I am aware off. It erupted some 50 km3 which is big but not huge, compared to Long Valley That will have to do with the size of the magma chambers. In a straight subduction zone they may have trouble growing big enough. You are right to point at the weight of the mountain above. In Crater Lake, one can speculate that it was the removal of much of the mountain in the VEI6 which led to the VEI7 eruption a little later. St Helens is not likely to do that. I don’t think being a straight subduction zone is really the reason why we haven’t seen more large eruptions in the Cascades. Indonesia, Japan, Alaska, Kamchatka, and the Andes all are straight subduction zones, all which have multiple vei-7 eruptors, and three of them have VEI-8 eruptors. There may be some other tectonic things going on in these regions, but you could probably say that much of this is caused by subduction itself. The cascades on the other hand are a smaller subduction zone. You have far fewer volcanoes when you compare it to the other arcs I mentioned, so it’s only fitting that you would get fewer large-eruptors. Also, the slab isn’t subducting at the same speed as some of the other aforementioned arcs. I tend to think this produces less melt. I’m sure there are other reasons as well as to why we don’t see more. One caveat is that Silverthrone was likely a VEI-7 eruptor at some point in the past, although I’m not sure if it counts as part of the cascades. The speed of subduction is certainly relevant. The dip angle may be too. I was thinking about extensional motion which you can get in a subduction zone that isn’t straight. It allows magma chambers to grow without increasing pressure. That would have played a role in Lake Toba. Something that I think is in play in the Cascades, is that much of the crust is made up of an assorted melange of various terranes and old island chains that have been scraped off onto the north American plate. Granted, other subduction zones have their own accretionary prism, but the region of terranes along the cascades is pretty wide. With a chaotic selection of old fault systems to choose from, getting a good enough “seal” to develop a lot of pressure is difficult… and the roof collapse potential seems to be higher, so you don’t get the really large structures. the area makes for interesting geology. the OWL, Brothers fault zone, etc.etc..
Must-read article by Erik Klemetti on Alban Hills outside Rome. The thought that it could be re-awakening is a bit frightening, even if its unlikely to do anything in our lifetimes. This is a volcano that if fully awakened, could potentially be top 5 on the MDE list with over 3 million people living within 30 kilometers. Nothing to be afraid of now, but it’s still a very interesting read. Double whammy at near Habunga. Two are listed as being extremely shallow in depth. Interesting.. Ongoing swarm. Too early say if hats will be eaten. For sure. If Katla does decide to wake up, it will be very noisy before an eruption, so there should not be any surprises here when it does decide to erupt. I would personally expect a vigorous swarm lasting for more than a day or two at least (but i’m not expert). I do somewhat wonder if this is similar to the minor phreatic event that occurred a few years back. Just wanted to say that this is one of the best science sites on the web. I gush about it to anyone who will listen! I also wanted to note Cascadia quakes–I extracted a chart from Goldfinger et al (2012) and think there were more than what’s in the write up. If there was a St. Helens eruption around 1482, that correlates with a Really Big quake that occurred around that time. Goldfinger et al is based largely on the seafloor turbidites though so there’s a much longer record than what’s on land. I’ve seen what those graphs look like when an eruption happens, but there’s a lot of things I don’t understand. Which ‘color’ is best for denoting volcanic tremor? Does the width of the bands mean anything? Clearly, people educated in volcanology find information in these graphs … I don’t … yet. Any help is appreciated. As I understand things, magma movement shows at the lower frequencies and is characterised by a signature “harmonic tremor” which is not always easy to spot. In the second paragraph, the question as to whether Hekla has a warning board is answered in the affirmative, so I was premature in my opinion. Guess I was being a bit 20th Century in my thinking. A text message to your mobile is a more effective alert method than an 80-year-old siren technology. Assuming that the hiker isn’t in a communication dead spot…. This is almost worth a Volcano Café reply – if such were possible. “biggest caldera formation ever observed.” Well, since the caldera was there before the eruption, it’s pretty safe to assume that the only observations being made are akin to those being done of Long Valley or Yellowstone. If so, then the article is very wrong starting with the first paragraph. Fortunately, the paper they are basing all their hype on seems to be done by people who actually know what they are talking about. I think the justification of the statement is in the word ‘observed’, meaning with detailed scientific measurements. 1.5km3 of magma withdrawal is a decent-sized hole. They don’t mean the entire caldera (which is rather older) but the bit added (subtracted?) by the 2014 eruption. Laki must have caused a bigger hole wherever its magma came from, but that was not observed. The paper mentions other recent cases of caldera collapses, all of which are much smaller than Bardy2014. I think the reason the paper begins with this is to convince Science to publish the paper. The authors know better and are quite careful not to be factually wrong. There are 1 or 2 things I think the paper missed, but nothing I would criticise it for. Interesting how well their conclusions agree with the discussions here at the time of the eruption. The exponential subsidence had been found here, the dipping ring fault, and the fact that the eruption was driven by gravity. One thing they missed was the change in the subsidence in (I think) October, when perhaps a feeder channel widened through collapse. The subsidence jumps during earthquakes was also noted here. One thing I am not sure about in their paper is their point that the drop of the piston increases pressure. At this depth, the pressure should be purely the weight of the piston. But in fact they later say that the flow was driven by the head, and that is indeed just the weight. 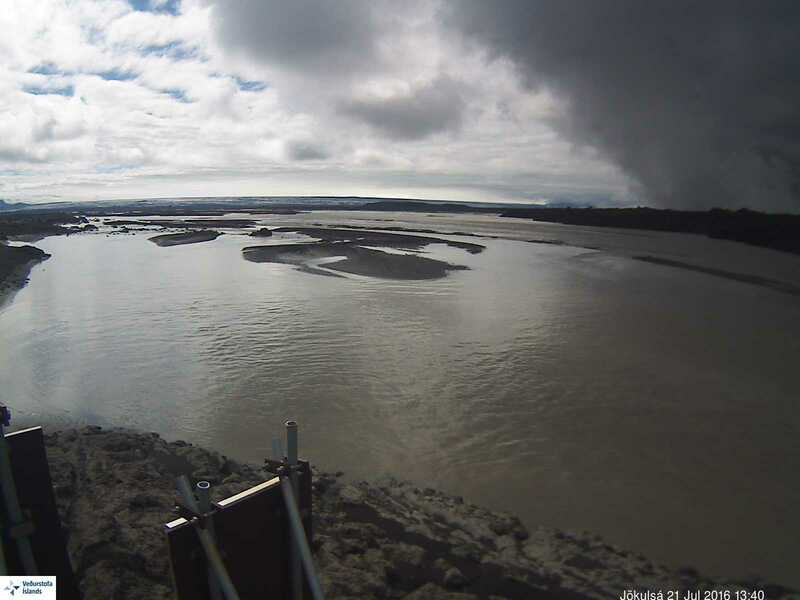 I gather from the paper that the connection between Bardarbunga and Holuhraun stayed open until the end of the eruption. That is not necessary: the volume in the dike could have driven the last month (or two?) of the eruption by itself. But the fact that the subsidence and eruption stopped almost at the same time (certainly within a week) is telling. The trapdoor model for the caldera is interesting, with an inward and an outward dipping fault on either side of the caldera. That could mean that the mountain moved during its building phase. A slight shift of the magma chamber. It always looked to me that BB has become more of a graben type feature that is sliding down on an angle. Almost like main chamber has been obliterated over time by rifting and dikes criss-crossing the entire region. The more I look at the quake patterns throughout the area, the more I see fissures and dikes going in many directions and crossing over each other and everything seems to be interconnected. 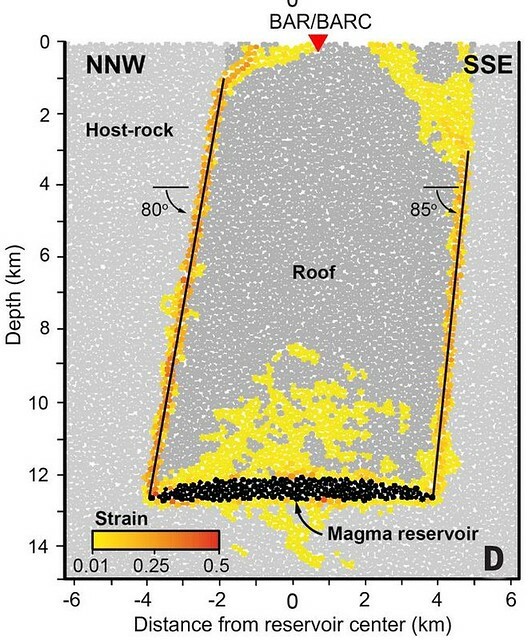 The quake patterns suggest there is a “chamber” or large pool of very hot material that extends under the rim on the NE side at a depth about 11km+. This means the pressure in the chamber supports the roof. As soon as the leak starts the reduced pressure in the chamber results in two things. First, the core under the caldera losses pressure and volume as the magma moves downwards to fill the void in the chamber below. Second, the “roof” of the chamber no longer supports the NE rim area it is undercutting. So what we see are quakes in the “hard rock” as the pressure reduces support, adding to the tectonic stress already there that created the leak in the first place. If you look at the graph of depth over time above the quakes run deep for a period of time and then both shallow and deep, this pattern has cycled about 5 times in total since September. Cause: If the roof of the chamber looses integrity it would fracture and then this would slowly transfer up the structure all the way to the surface. Of course the deep structure would have the most pressure so it fractures for a time and then the shallow area follows in spurts. The pattern of quakes suggests the south side does not have anything undercutting it and the “wall” of the core on the south goes down to 12-13km is sloped inwards to the center. 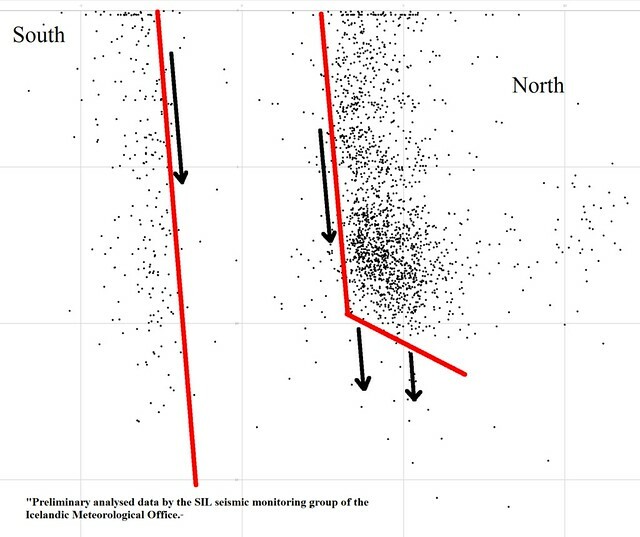 The north side quake pattern suggests an outward slope. This would mean as the core sinks the support under the entire north side is reduced but this is not the case on the south side. Is there magma going into these cracks and openings? Most likely but right now I have not seen any sustained tremor in the drum plots that would suggest this is happening to a great degree. Also, some of what looks like magmatic quakes on the drums I believe is due to the waves travelling through the core of BB. Ian, I am probably a total numpty, but these diagrams remind me of the suggested ‘Glencoe type’ of caldera formation wherein a central plug slips downwards while magma ultimately leaks up round the margins. (I think there have been suggestions that Askja is of this type). Did a brief google, and came up at once with a Bull. Volc. paper by John Browning & Agust Gudmundsson on caldera ring faults (it’s a pdf, don’t know how to post a link: I googled ‘glencoe caldera’ and it was on the second page of results) Their paper was based on fieldwork at Hafnarfjall in western Iceland. It seems to me that the ring fault system is pretty much void of active channels of magma or they would have become apparent during all this movement and shaking. I would agree with that assessment. Are there records of past eruptions from the caldera? A shallow magma reservoir could still go through the top. All others leak out through the sides. It has been pointed out here that the ‘ring fault’ looks more like two parallel linear faults. But in either case, the lack of earthquakes on the east and west side need explaining. Since the continental plates are being pulled apart in the east-west direction, and Bárðarbunga sits in the middle, I would guess that the rifting relieves some of the strain from the east and west sides of the ring fault. That would make it more likely that the north and south side lock up, and that initial break of an earthquake occurs in one of those locations. Even if there is movement along the entire ring fault, the hypocenter only marks the position where the quake started. I do not think there have been eruptions that are tied to the caldera alone. but if you look at the north side of the rim, there sure appears to be massive flows that originate from there. Turn off the first 3 visible layers and note that the post eruption quake pattern (yellow) in the caldera is very different than the patterns from 1995 to the end of the eruption. Toggle the first two layers on (black and red) and the change is striking. The quakes before and during were in the NE and along the south, and look like they were on the ring fault, in the area of stress that Tomas points out. Now they are centred in a more circular pattern around a point in the NW quadrant. The most recent quakes are coming from deep so it looks to me like BB is filling up from a completely different location than in the years since the quakes have been recorded, somewhere in the NW corner. We see inflation on all the GPS points centering on BB and we also know the initial quake movement is opposite to the quakes during the collapse. I also looked back and found the initial movement on the Gjalp quakes matches the movement on the more recent inflation quakes. Mauna Loa is also carrying on a little cranky. There’s a definite uptick in seismicity there as compared with anything in the last year – but nothing in any of the data I could call an inflection point. Mauna Loa has ‘teased’ before – but who knows… maybe in hindsight we’ll call this the beginning of the beginning. When she goes by all accounts she goes very quickly; this won’t be a ‘three weeks of big quakes and will she or won’t she?’ kind of situation. We just spent 8 days on the big island. Took the kids on a helicopter ride (they are allowing people to hike to the current edge of the lava flow but it is approx. 10-12 mile round trip over lava, not good for 8, 10 year olds) we saw lava flowing in skylights near the cone and saw a flow at the base of the hill. And followed once again by a series of smaller, shallower quakes. Yep Bard gots it’s star. 🙂 I like the graph on 3dBulge. It’s active, so it may change if wait too long to see it. Can someone put it on here? Although there are quite a few aftershocks, I don’t think Carl would consider this “wet”. You should be able to just put the http address in the comment, on a separate line. It should be a link to just the image, and not have embedded code, otherwise she-who-must-be-obeyed will remove the link from the comment. Check in your own browser whether the link brings up just the image or whether you get a framed view (=no go). Youtube links tend to work. I must admit that I cheat. I upload any image to the VC admin before linking. But for anyone else, it is a matter of trial and error. Capture the image (I use Chrome Awesome Screenshot), save it, upload it to Imgur.com, copy the BBC address from Imgur into your reply and remove the bracketed stuff at the beginning and end (the last 6 characters and the first 5 characters). Additionally, the link to the image should end in an image specific extension such as jpg, png, or gif. If not, Word Press may interpret it as some sort of script and take greater scrutiny over what it may or may not be, and possibly throw the whole comment in the potential spam bin. A random thought, inspired by Albert’s reference to St Helens’ name. It struck me that the Royal Navy has had a remarkable influence on the names of active volcanoes. At least four British Admirals have been thus honoured (Hood, Rainier, Burney and Benbow) along with at least two ships, Falcon and Erebus -this last being of the ‘Hecla’ class (you couldn’t make this up!). I could have added HMS Terror, but that volcano is quite possibly extinct. Can anyone add any others? None that I know off. There was a British navy ship called Vesuvius and one called Volcano. Wolf volcano (supposedly extinct until erupted last year) was named after a geologist which may be more fitting. And I would like to know, who was Kick-em-Jenny named after? It apparently is a reference to the waters around it being very rough. The volcano itself was unknown until 1939. This seems quite plausible! It sounds right. Is this the strangest name of any volcano? No help from google on that; I did wonder if it might be pidgin? Yeah, always have. Minesweepers were allegedly named after birds, though exciting sounding words seem to fit the task as well. Traditionally, whenever the captain of a vessel arrives back on board, the name of the ship is used to announce the arrival over the shipboard general announcing circuit (1MC). Can you imagine the skipper of the USS Auk? On a more sobering note. The USS Solar (DE 221) exploded at Pier 1 in Leonardo New Jersey. The last ship I was stationed on was homeported there, reportedly, a very frightened looking piece of debris from the Solar’s explosion was set up as a memorial outside the admin office for that part of the base where it landed. I absolutely hated that pier. It’s too long to walk, and bicycles are forbidden since it’s entirely possible for you to fall off of it with no one ever having the ability to see you fall. On one return from deployment, there were blizzard conditions at the end of the pier and bright and sunny at the foot of the pier, just chilly. The pier 1 where Solar exploded is at about the mid-point of the current pier system. The design doctrine around AOEs is to put a protective buffer of fuel tanks around the ammo storage compartments. Lets just say that didn’t give me a warm fuzzy. But, the Sacramento class of AOEs is gone now, too manpower intensive for the mostly civilian crewed Military Sealift Command. Their replacement, the Supply-class fast combat support ships are gas turbine driven rather than 600 psi steam plants. The original Sacramento AOEs were the result of cancellation of the follow-on to the Iowa Class Battleships and used their basic keel structure. Though I was never quite fond of that ship, she did her designed job quite well. A well trained crew could easily outpace an AE in moving ordinance and stores. Mainly from the number of cargo elevators and staging space that were available. Not that the Supply class isn’t good, they can sling cargo about as fast as an AOE-1 class. 30th Anniversary Documentary for the eruption of Mt. St. Helens, very informative and thankfully lacking in overly dramatic voices. Probably not much new info in it for you guys, but there’s lots of beautiful footage of the area. Small swarm of quakes in Katla tha last days from 10+km deep and upwards. Something building up or only the normal Katla summer quake season? The Godabunga swarm goes on from deep to shallow. Katla summer party, or warming up for busines? 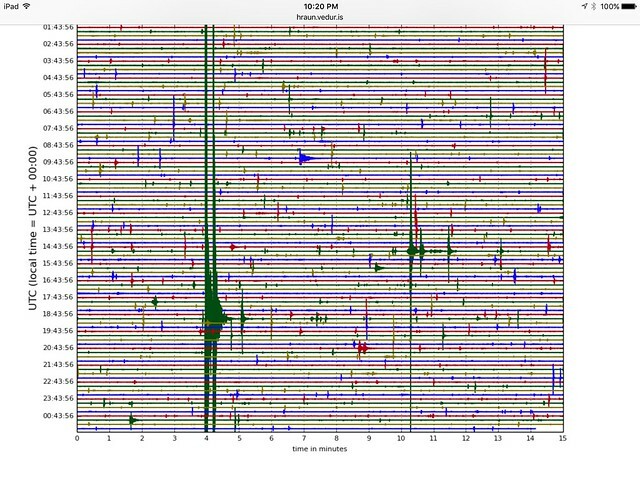 The drumplot is show many small quakes in the last few hours, not recorded on the SIL, the tremor plot shows a thickening of the high frequency (blue) band, the increase on the bottom line is not significant but the thickening is. Also, check out the strange waveform on the recent quake with the double peak. As shallow as that double peak event was, and as sharp as it was, I’m thinking it was a fracture in the glacier. Wouldn’t that require there to be a 4km-deep ice sheet in Iceland? I don’t recall that even the Antarctic ice sheet is quite *that* thick. I wonder is they could accumlate the energy released could they come up with some sort of prediction method or at least when it’s more likely to slip. I would take this with some healthy scepticism. Tidal forces on rocks are really very small. The only place where you may get something is in tidal bays where the weight of the water varies a lot. Note that in the study quoted above, it isn’t the tide itself which correlates with the quakes, but the cycle between neap tides and spring tides, and the quakes correlate not with the spring tide but with the period midway between where the amplitude increases most rapidly. That is getting so vague that you really want confirmation from another source. Other effects would be much larger over such time scales. Also, in that case the final quake would not happen at a specific phase of the neap/spring tide but at the tide itself. That is one of the funny things: there isn’t really anything special about the time of this cycle which they find correlates with the quakes. Badan Geologi have good quality web cam images of Sinabung. One of the ugliest looking volcanoes is Sinabung. Is it only geothermal activity? I seem to have seen a few of these recently… is anyone keeping track of quake frequency in that area? I also have a feeling that the frequency has increased in that area. If you check Ian’s map, there does seem to be quite a few quakes on the latest map layer. 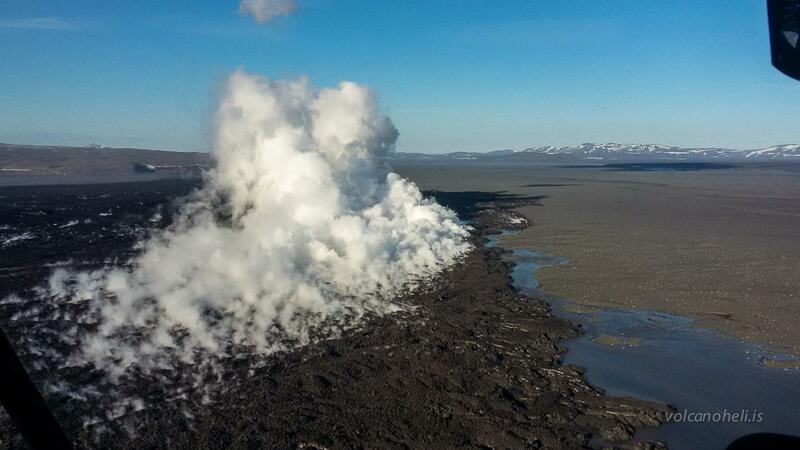 Also note the recent activity under the ice cap stretching from Grimsvötn towards the Laki fissure. Is there something going on just south of the caldera? 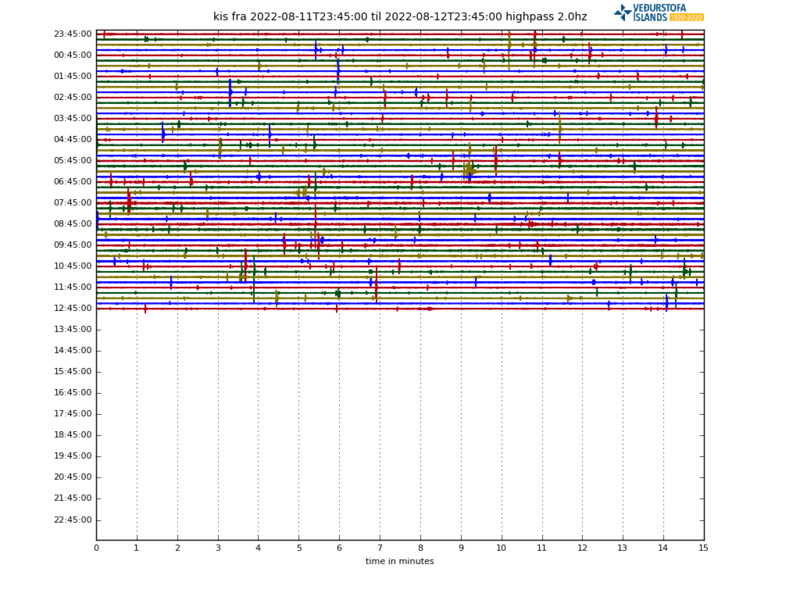 Can someone better educated than myself take a look at the seismograph data nearby? There was a long ‘magma’ like quake recently that seems to have caused a bunch of pressure cracks near the surface (my interpretation). I’d love to hear your opinion. New post is up! A Carl introspective on Guatemala. 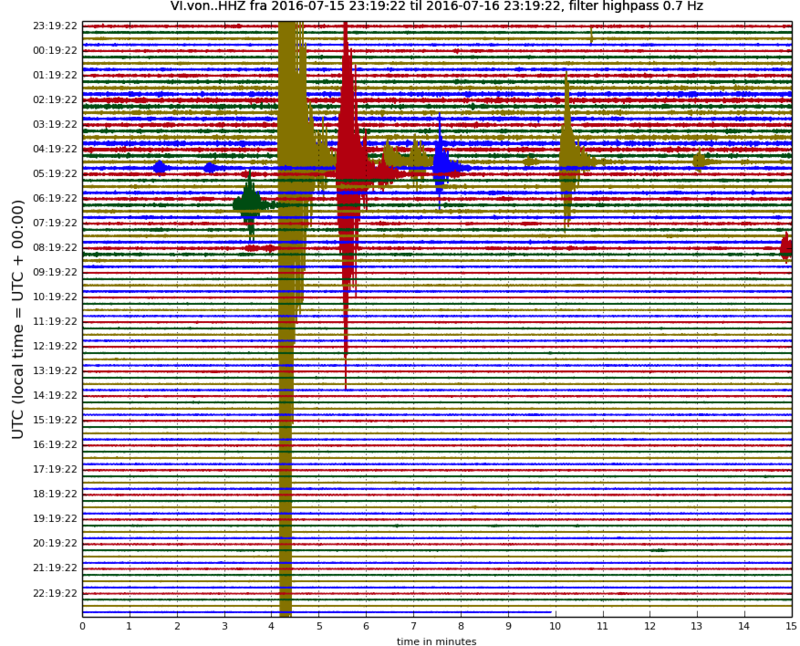 Tremor picking up around Loki-Fögrufjöll it seems.